My mom loves to watch the Hallmark Channel. When we were visiting recently, the topic of how to watch Hallmark Channel without cable came to mind. We were out one night enjoying a meal together and my mom casually remarked that she was missing her Hallmark Movie for this so the food had better be good. What she didn’t realize is that a simple streaming option with a DVR feature would enable her to go out without fear of missing her favorite Hallmark shows. My mom and many others enjoy watching Hallmark Movies, especially during the holidays, and want to know how to get Hallmark Channel without cable. The network has done a good job of transferring the sentimentality that made their greeting cards famous to their shows and movies. Personally, I’m not a huge fan, but even I could get interested in ways to watch Hallmark Christmas Movies without cable after seeing The Christmas Train. For years, the only way to enjoy Hallmark Channel content was through a cable provider. That is how my mom gets Hallmark today, but it’s not the only way; there are many different ways to watch Hallmark Channel without cable today. If you’re like my mom, you’re already getting excited about Hallmark’s Christmas movies, which start running in mid October. You can enjoy access to those holiday movies along with Hallmark’s ongoing shows and mysteries just by learning how to watch Hallmark without cable. My mom doesn’t know it yet, but she can stream the Hallmark Channel without cable (and so can you!). You don’t need an expensive cable contract to watch your favorite Hallmark shows. In fact, there are affordable ways to watch shows like Home & Family, Chesapeake Shores, Good Witch, When Calls the Heart and Hallmark Movies that don’t require a cable contract. Many of the major streaming services have had years to refine their menus and content offerings and now offer excellent programming at the same clarity as cable for less than half the cost. 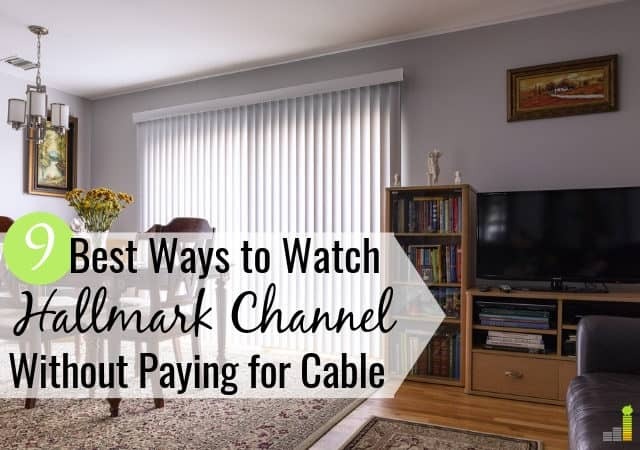 If you’re still paying too much for an overpriced cable contract because you’re afraid of losing access to your favorite shows and movies, the following options will show you the best ways to watch Hallmark Channel without cable. Sling TV is one of the leading streaming services on the market. 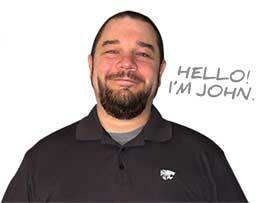 Having been around for years, it offers an intuitive interface and reliable service. Many of the most popular channels are available through Sling TV Orange or Sling TV Blue. The good news is that the Lifestyle Package only costs $5 per month. Since Sling TV starts at $25 per month, you could enjoy your favorite Hallmark Channel shows plus ESPN, HGTV, Disney Channel, AMC and much more for only $30 per month. With the average cable bill topping out at $110 per month, that’s an instant savings of $80 per month, which makes Sling TV a good answer to the question of how to get Hallmark Channel without cable. If you want to learn more about the content offerings as well as pros and cons of Sling TV, check out our Sling TV review now. Try watching the Hallmark Channel on Sling TV risk-free now with their 7-day free trial. If you enjoy lifestyle and entertainment TV and want to know how to watch Hallmark Channel without cable, Philo may be the best streaming service for you. For less than $20 per month, you can get Hallmark, plus many other channels and lots of other great content. Philo TV has been around for years and offers one of the best cable TV alternatives if you want a good selection of lifestyle and entertainment content at one of the lowest monthly rates with no contract. This makes Philo TV one of the best ways to stream Hallmark Channel without cable. The one complaint with Philo TV is that it doesn’t offer access to sports channels like ESPN or FOX Sports or local channels. If you don’t tend to watch sports on TV, then you won’t have any trouble with Philo TV. While Philo TV doesn’t include local channels, a simple digital antenna like the Mohu Leaf, can solve that problem for you quickly and cheaply. Learn more about Philo TV in our in-depth Philo TV review that completely covers the service. If you’re looking for how to watch Hallmark Channel without cable, Philo TV could be the perfect cord cutting solution for you. You can try Philo TV for free for 7 days to test out the service and see if it meets your needs. This streaming service got its start showcasing a knockout lineup of international soccer matches to a diehard base of futbol fans. When it launched in 2015, FuboTV was all about soccer games and while it remains the best online streaming service for soccer, it has expanded beyond it. Today, FuboTV is it an excellent choice for watching sports without cable and a solid option to get Hallmark Channel without cable as well. That’s a lot of lifestyle and entertainment offerings for what has traditionally been known as a sports-forward streaming service. It’s just another example of how strong the market for alternatives to cable TV has become. Really, you’re not missing anything (including the Hallmark Channel) when you chose to cut the cord and opt for a streaming service. FuboTV gives you the option to watch live TV and record programs on its cloud DVR as well as other features that you can read up on in our FuboTV review. If you’ve been wondering how to watch Hallmark Christmas movies without cable, FuboTV could be a good option for you. Both the Hallmark Channel and Hallmark Movies & Mysteries are included in FuboTV’s base package, which costs $44.99 per month. Upgrading to the Fubo Extra package for $49.99 will get you Hallmark Drama as well as the Hallmark Channel and Hallmark Movies & Mysteries. You can enhance your experience with other add-on packages but either Fubo or Fubo Extra is all you’ll need to stream Hallmark Channel without cable. Try watching your favorite Hallmark movies and shows for free now with a FuboTV 7-day free trial. DirecTV’s easy-to-use menu, reliable service and broad content offering make it one of the most popular alternatives to cable TV on the market. If you’ve been asking, ‘how can I watch Hallmark Channel without cable?, DirecTV is another way to do it. We’ve personally tested the DirecTV now platform multiple times and have found it both easy and enjoyable. In addition to watching sports and news, DirecTV Now is an excellent way to watch Hallmark Channel without cable. Its baseplan, which costs $50 per month, will give you the Hallmark Channel and Hallmark Movies & Mysteries. Like FuboTV, you’ll also be able to watch either of these Hallmark channels live with DirecTV Now. Plus, you can go up to 72 hours back in time to access Hallmark past programming on demand. 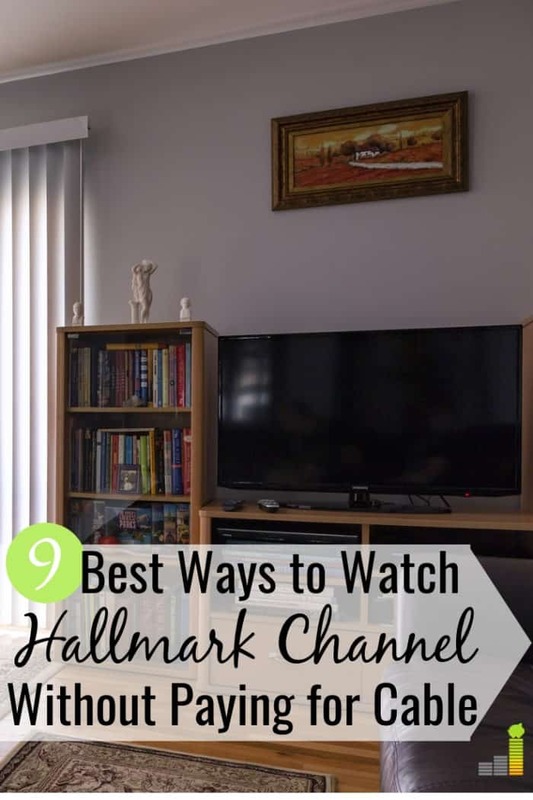 Even without a DVR, this is a convenient way to watch your favorite Hallmark movies and a great way to watch Hallmark Channel live stream. Want to know more about DirecTV Now? Check out our DirecTV Now review. If you’re a PlayStation fan, or have a partner or child who is, then you may already know about PlayStation Vue as a solid streaming option. While PlayStation Vue plans start at $39.99 per month for more than 50 channels, you’ll need to upgrade to its Core plan for $49.99 per month to get the Hallmark Channel. You can enjoy news, family and sports content as well on PlayStation Vue without a PlayStation device as it works with Amazon Fire TV and other streaming devices. At this point, you may be thinking that while you like Hallmark movies, you don’t necessarily want to pay for a streaming service just to watch them. If you want to cut your cable contract but don’t know how to stream Hallmark Channel, you have several options. Now, if you’re trying to figure out how to get Hallmark Channel for free, you may be disappointed as there’s no way to get Hallmark Channel without cable for free. However, there are several affordable, low-cost options. Hallmark has its own streaming service called Hallmark Movies Now. For only $5.99 per month and absolutely no contract, you can sign up and try it out. Just go to their website to learn more. They offer a deal where you can sign up for an entire year for $49.99, which knocks a bit off the overall cost. This may be a particularly good option if all you really want to watch are Hallmark Channel Christmas movies from mid-October through the end of December. If that’s the case, you can scratch your Hallmark movie itch for just $15. Hallmark Movies Now works with a variety of streaming devices and platforms including Apple TV, Amazon Fire TV, Android devices, Samsung and Sony smart TVs as well as Xbox One, iOS systems, and Chromecast. If you don’t like the idea of a monthly fee, you can buy Hallmark Movies one at a time on Amazon, Google Play, or iTunes. Just visit those platforms and search for the title you want to watch. One payment lets you ‘own’ the movie and watch it whenever and as many times as you’d like. If you’re not sure which option will work best for you, Hallmark Movies Now does offer a seven-day free trial, so you could test drive the service and see if it is worth the monthly cost to you. Keep in mind that Hallmark movies are not available on Netflix so if you want to watch them, you’ll have to go with one of the options mentioned in this post. Can I Watch Hallmark on Apple TV, Chromecast, Fire TV, or Roku? The answer is yes. All of these services are well supported and make it easy to watch Hallmark Channel without cable. Whether you prefer Amazon Fire TV, Amazon Fire TV Stick, Apple, Chromecast, or Roku, you’ll find it simple to watch your favorite Hallmark Channel content on them. 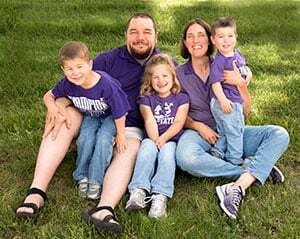 To sum it all up, if you have finally grown tired of paying for your overpriced cable or satellite TV contract, but don’t want to give up your access to Hallmark Channel movies and shows, you have options. From Sling TV at $30 per month to FuboTV at $44.99 per month to Hallmark Movies Now for just $5.99 per month, there’s a plan and streaming service to fit your needs and budget. If you’re still hesitant or unsure about which one you’ll like best, remember that most of the platforms offer free trials so you can try out the service and see if it’s right for you without paying a dime. You can cancel your expensive cable contract today and try each of the streaming services mentioned in this post one week at a time until you find the one that works best for you to watch Hallmark Channel without cable. After a few months of trying the various alternatives to cable for free, you can select the right one with complete confidence that you can watch all your favorite Hallmark Channel movies and shows without the noose of an expensive, overpriced cable contract hanging around your neck. If you’re tired of paying too much for the Hallmark Channel and the other lifestyle, sports, news and other programming you enjoy, cut the cord on your expensive cable contract and put the $50+ dollars you’ll save per month to better use. How do you watch Hallmark Channel without cable? What other channels keep you from cutting the cord? How much money do you spend on cable/cable replacement services each month? Very comprehensive;however I think these streaming services require the installation of a device.Do I not need a Firestick or Roku to take advantage of these services? I believe that was actually addressed in the post, but yes in some cases you’ll need something like a Fire TV Stick or Roku to access a streaming service. If you hve a Smart TV, you may not need one. All the above sounds great. One caveat …. I still need internet. I only have a choice in my area of Comcast with the lowest rate being around $40 first year and going up to $75 second year or Verizon DSL (slow as molasses). When I add up the Sling TV price which is superb and the internet price for the first year I get the savings I am looking for. In the second year I am paying about what I am now for Comcast minus the X1 voice remote which is really dandy. So, my question is how to work around the internet price and it seems I cannot at least where I live. Any thoughts? Hallmark Movies Now does offer quite a few holiday titles, however, they are older titles. The new titles are only available with a cable or streaming package or through Kodi. With Kodi you will need to look up each title individually but it costs nothing. Good to know Mike. I’ve never personally used Kodi, but good to know.